Adult apterae of Lipaphis alliariae have a blackish or dark blue-green dorsum with four longitudinal series of dark patches (see pictures below). The patches are clearly defined in immatures, but much less so in adults. The antennal terminal process is 1.2-1.35 times the length of the siphunculi (cf. Lipaphis erysimi which has the antennal terminal process 0.8-1.15 times the length of the siphunculi). The third antennal segment is 1.0-1.8 times the length of the siphunculi (c.f. Brevicoryne brassicae which has the third antennal segment 2.5-3.7 times the length of the siphunculi). Abdominal tergites 1 and 7 are without marginal tubercles. The siphunculi are slightly swollen and are 1.1-1.6 times the length of the cauda (cf. Brevicoryne brassicae which has siphunculi 0.8-1.0 times as long as the cauda). The body length of adult Lipaphis alliariae apterae is 1.6-2.1 mm. The micrographs below show a Lipaphis alliariae aptera in alcohol, dorsal and ventral views. 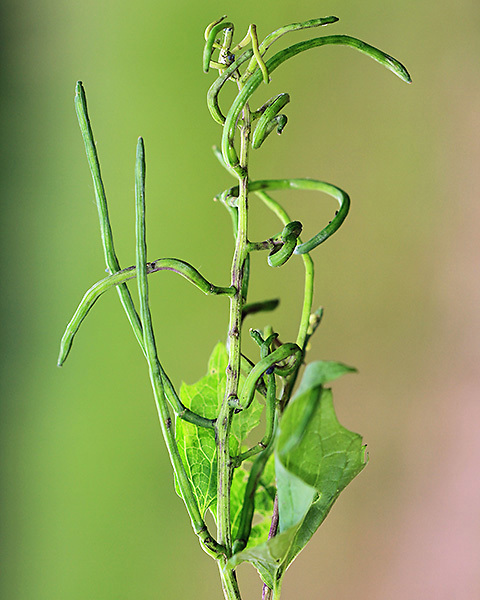 Lipaphis alliariae feeds on the stems, seed pods and senescing leaves of garlic mustard (Alliaria petiolata). It does not host alternate. Sexual forms, wingless males and oviparae, occur in October. The grenade aphid (presumably so-called because of the resemblance of the aphid in dorsal view to a hand grenade) has a rather patchy distribution in Europe, occurring in France, Sweden, Finland, Poland and Germany, but (at least until 2018) not in Spain, Italy, Britain or Norway. In September 2018 we found the aphid for the first time in Britain feeding on senescing leaves of Alliaria petiolata growing at Jordans Mill in Bedfordshire. Lipaphis alliariae has been seen both as a minor pest and as a potential biological control agent depending on whether its host plant is viewed as a (minor) food crop or a weed. Our observations are the first records of this species for UK. Blackman (2010) noted that in Europe there was a species of Lipaphis, Lipaphis alliariae, that is specific to garlic mustard (Alliaria petiolata), but was not yet found in Britain (see picture below). 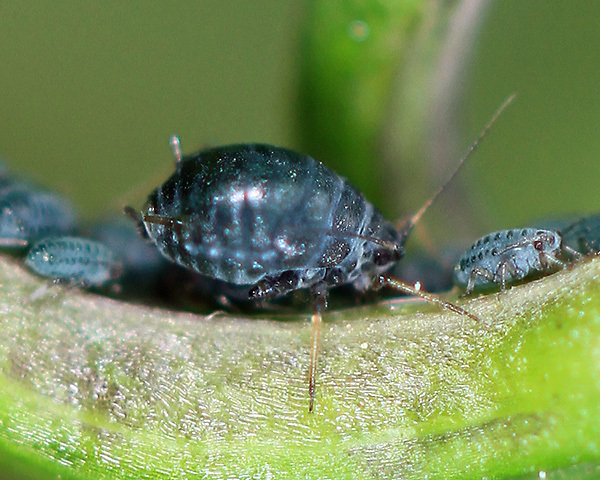 In September 2018 we found this species of aphid feeding on the underside of senescing leaves of garlic mustard in a meadow at Jordans Mill in Bedfordshire, England. 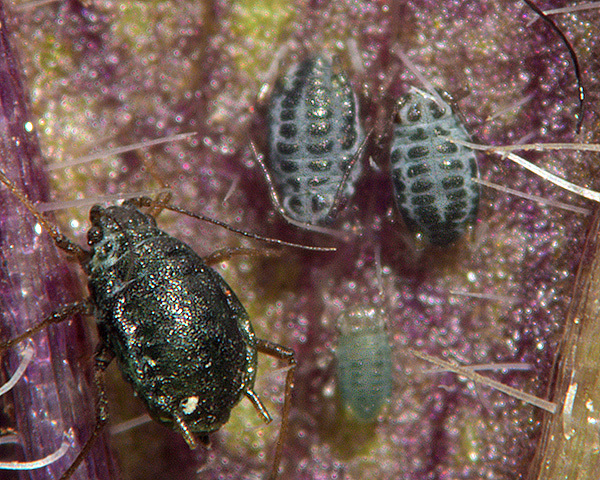 In continental Europe the aphid is most commonly found on the stems and seed pods of garlic mustard. At Jordans Mill in September the aphids probably moved to the senescing leaves of the plants because the stems and seed pods had dried out. 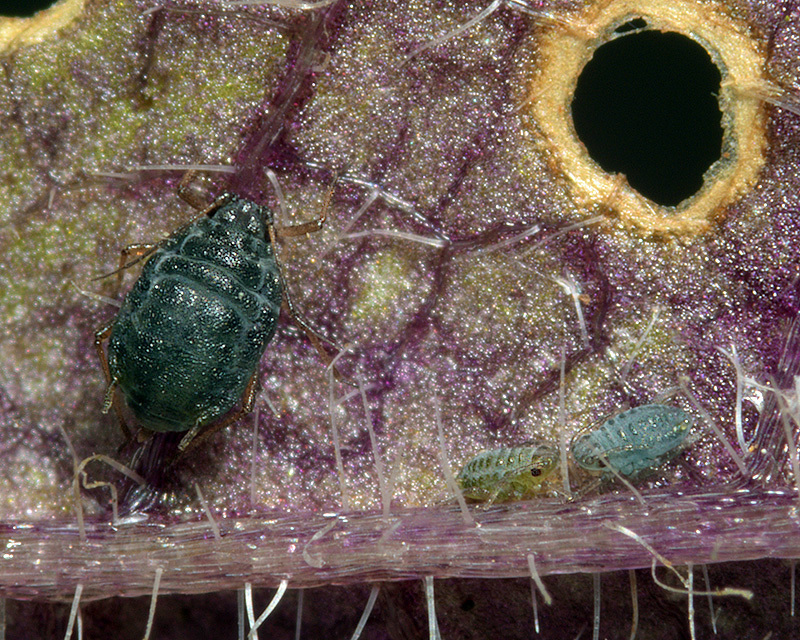 Senescing leaves provide a ready source of available (soluble) nitrogen to aphids. 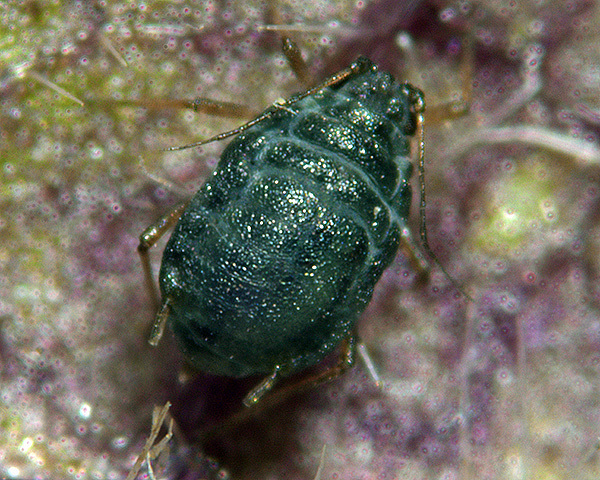 The immatures of the garlic mustard aphid have clearly defined longitudinal rows of dark patches which stand out against the light grey dorsal cuticle. These patches are present, but less clearly defined on the adult, giving a mottled blue-black colour. Despite their shiny appearance, however, these patches are apparently not sclerotized, and therefore do not show in preserved specimens (see micrographs above). Doncaster (1954) notes that macerated specimens of Lipaphis erysimi and Lipaphis alliariae are almost indistinguishable, leading Dr F.P. Müller to conclude that alliariae is a subspecies of erysimi. However, Doncaster pointed out that in life there is a distinct colour difference with Lipaphis erysimi being dull grey and Lipaphis alliariae almost black. Lipaphis alliariae is now fully accepted as a good species, distinct from Lipaphis erysimi and specific to garlic mustard. 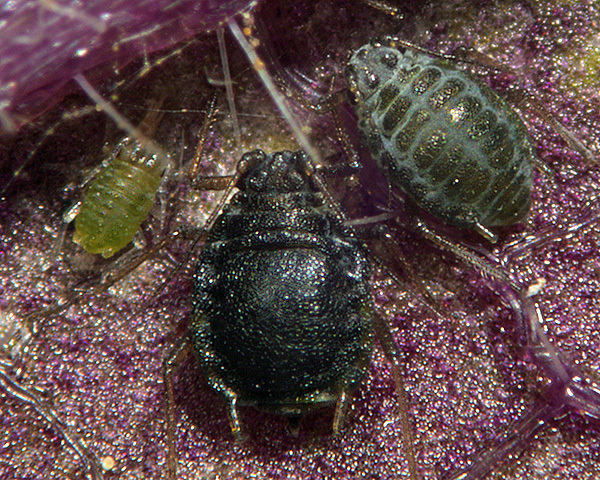 Blackman & Eastop list 9 species of aphid as feeding on garlic mustard (Alliaria petiolata) worldwide, and provide formal identification keys. 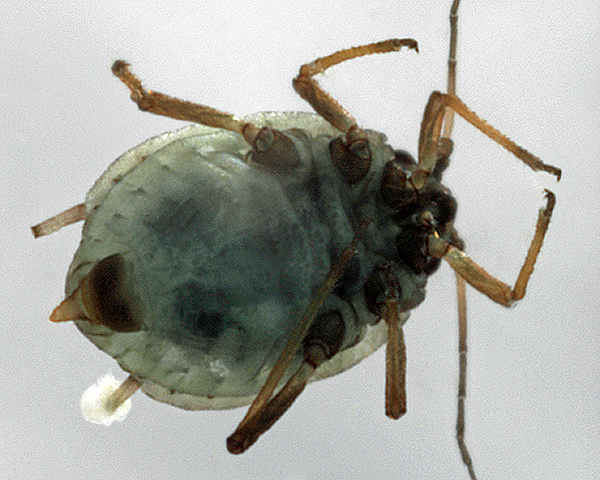 Of those aphid species, Baker (2015) now lists all 9 as occurring in Britain: Aphis gossypii, Brevicoryne brassicae, Lipaphis alliariae, Lipaphis erysimi, Myzus ascalonicus, Myzus ornatus, Myzus persicae, Nasonovia ribisnigri, and Rhopalosiphoninus latysiphon. In Europe garlic mustard is grown on a small scale in herb gardens since it can be used as an alternative to garlic. 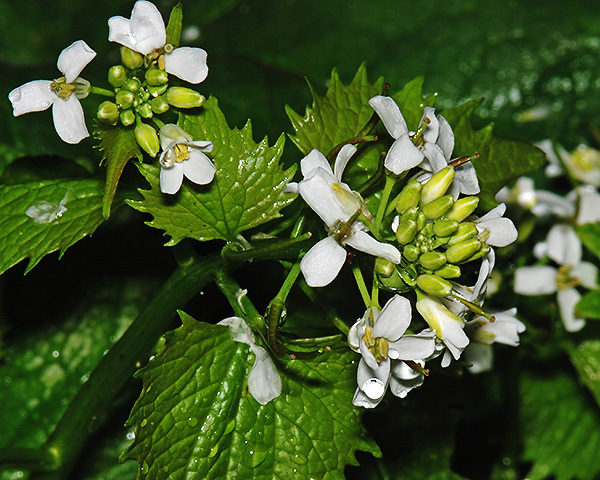 The grenade aphid Lipaphis alliariae causes damage to garlic mustard by severely distorting the seed pods (see picture below of flowers and developing seed pods). The two slightly-curved, long pods on the left of this seed head were largely unaffected. Lipaphis alliariae is therefore considered a (minor) pest in Europe. The situation is rather different in America where garlic mustard is a serious invasive pest which competes with indigenous plant species, especially in forests (Rodgers et al., 2009). 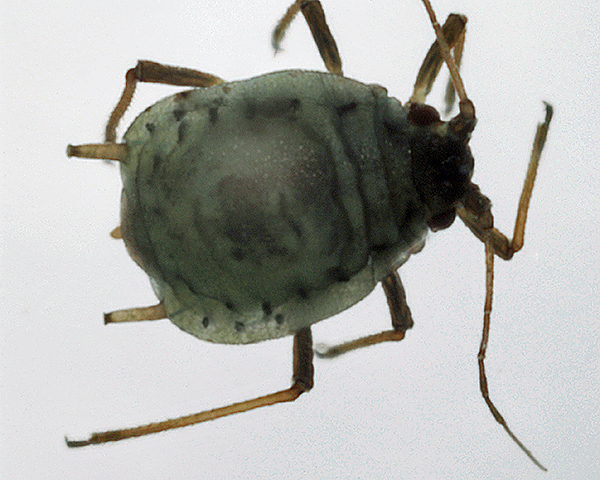 Efforts are being made to find a suitable biological control agent (Blossey et al., 2001). So far three European weevil species (Ceutorhynchus spp) seem to offer the best prospects, but a Lipaphis aphid has been noted in the field in America causing twisted distorted seedpods (Van Riper & Becker, 2014). The species was identified as Lipaphis brassicae (a non-existent species), but the author presumably meant Lipaphis pseudobrassicae, a serious polyphagous pest species in America. That species clearly cannot be used for biocontrol, but the monophagous (single-host) Lipaphis alliariae may indeed offer good control prospects. We particularly thank Stéphane Claerebout, and Willem Ellis of Plant Parasites of Europe, for several images above, Alan Outen Bedfordshire Invertebrate Group for his help and assistance, and Jordans Mill, Bedfordshire, for permission to sample.